Double portrait of the artist in time. 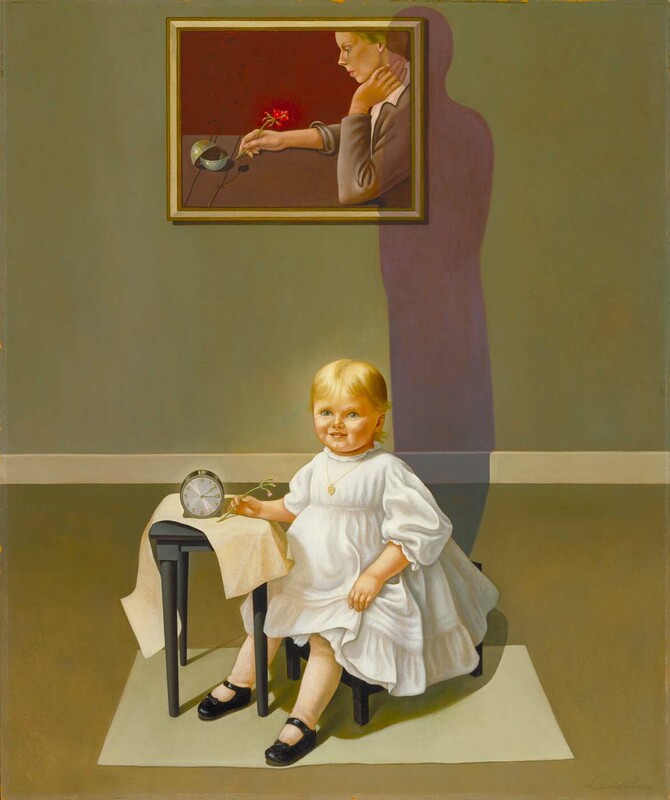 If you liked the time-travelling artist, Helen Lundberg’s Double portrait of the artist in time (1935) is the thing for you. It is played on the same paradox. How can the little girl with the budding shoot pose in front of a painting of herself in her blossoming twenties? The shadow (also appearing in Bailly’s painting as his wife’s ghost) seems here more polyvalent and opaque — Is it the artist’s? Her older self perhaps, older than both her representations? Or might it not be her ancestors’? I love your blog. Haven’t searched the archives yet, but have you talked about Chuck Close’s work? I love his Polaroids as well as his large paintings made up of smaller portraits, treated as pixels. I could be wrong, but that’s how I remember some of his earlier work. Thanks for the blog! I haven’t heard of him, no — so thanks for recommending the artist, brother, thus taking advantage of the fact that this blog is always open for suggestions. Just saw an article about Chuck Close: http://huff.to/16wahWS. Let me know your impressions. Thanks for the article, it gives me a good angle from which to tackle Close. It is not an idle question. Perhaps the point is reminding us that an artist used to be first and foremost a great craftsman, someone who could master a technique (art and technique are expressed by the same word in ancient Greek) and do something with it. And perhaps — especially after conceptual art — we do need reminding.